Easy and protein-packed granola balls — these energy bites make the perfect snack or breakfast on the go! 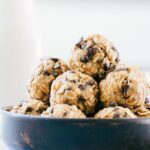 These energy bites make the perfect snack or breakfast! They are filled with healthy fats, good-for-you grains, and a little bit of chocolate just for good measure. 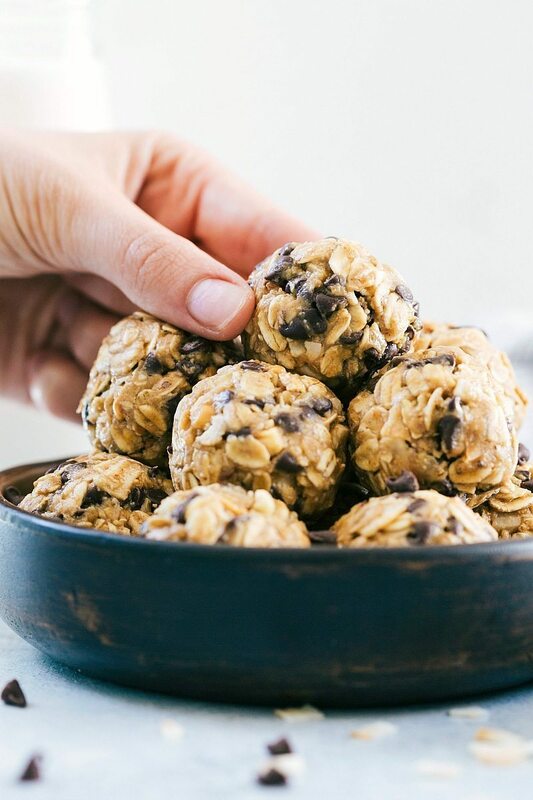 These energy bites are perfect for an on-the-go breakfast, quick snack, pre or post-workout fuel, road trip treat, hiking fuel, or late night snack. Or….all of the above because you might find these pretty addicting and crave them all the time. Which is definitely not a bad thing since these are made with healthy and wholesome ingredients! 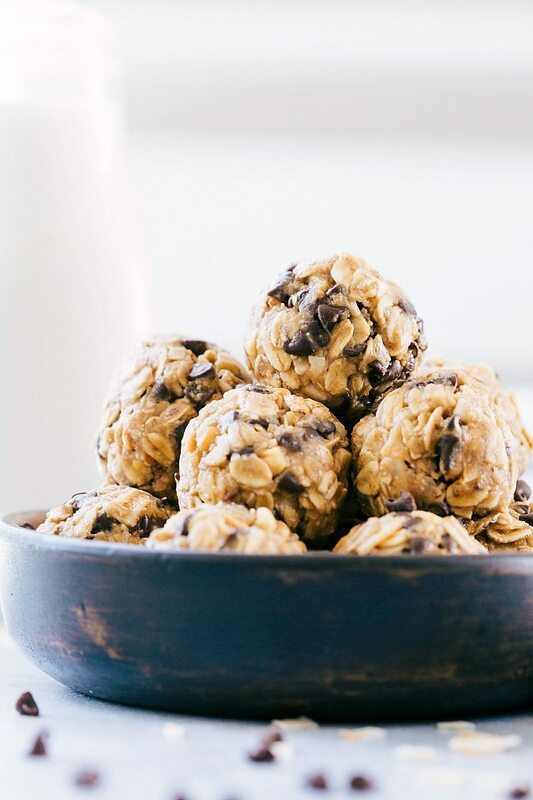 And because of the natural sweeteners and protein-packed ingredients, these energy bites will keep you fuller for longer and satisfy your sugar cravings. These energy bites are pretty easily adaptable. As long as you can get a consistency that stays into a granola ball, you’ll be golden. You can swap out peanut butter for different nut butters if you have allergies. Another fun adaptation is to use crunchy peanut butter for a little extra texture. You can omit the chocolate chips or use dark chocolate chips for a healthier (dark chocolate has great healthy fats and antioxidants) addition. You can replace the chocolate chips with a different mix-in (think chopped nuts, chopped craisins, extra coconut). You can replace the oat flour with flaxseed or wheat germ. Easy and protein-packed granola balls -- perfect snack or breakfast on the go! In a regular food processor or blender, add in some old fashioned oats and pulse until the mixture resembles flour. Measure to get 1/2 cup and you'll have oat flour! 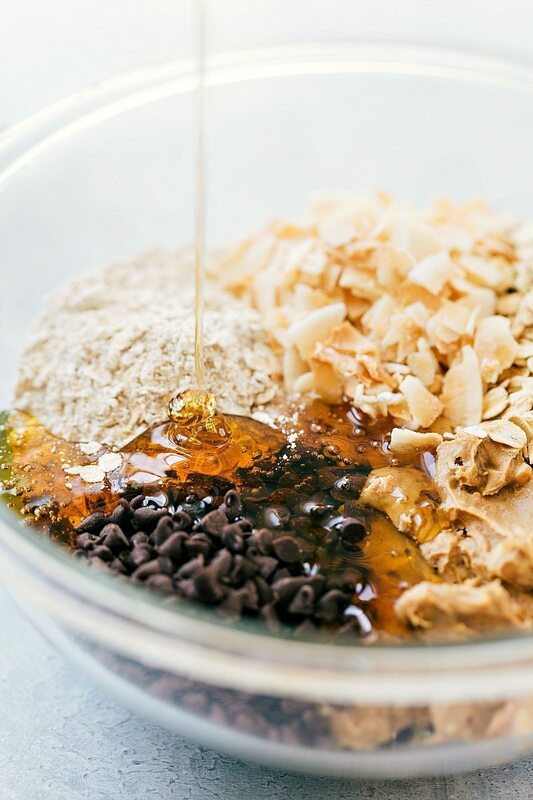 In a large bowl, add the peanut butter, honey, vanilla extract, and salt. Stir until smooth. Add in the oat flour (measured after blended), old-fashioned oats, toasted coconut flakes, and miniature chocolate chips. Stir until all ingredients are well incorporated. Place in the fridge for about 15 minutes to chill. Once ingredients are chilled, roll them into even-sized balls. Store in an airtight container in the fridge or at room temperature for up to 7 days. To ensure these energy bites are gluten free, confirm your oats are certified gluten free. they look yummy and cute! Did you try freezing them? Do you have an idea what the nutritional value would be for these? For someone on a Keto diet. Also I just made these and they are delicious! DO you have the calorie count and carbs ?